I don’t know about you, but I love nuts. 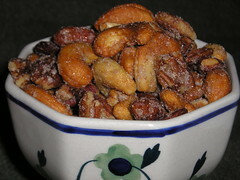 Over the years I’ve made a lot of spiced nuts myself at home, but these are actually honey-roasted mixed nuts from Walgreen’s. They are quite good, and once they’re put into a nice dish, your guests will never know what a bargain they were. CVS also has good prices on nuts, as does (no surprise here) Trader Joe’s. Who would have thought we’d be buying nuts at the drugstore? And when I was in CVS just before Christmas, I noticed the half-and-half in their refrigerated case was hormone and antibiotic free, from Pennsylvania, which pretty much qualifies as local for buying milk. I used some in the ricotta cheese I made. Who knew? !